You can never know too many ways to start a fire. 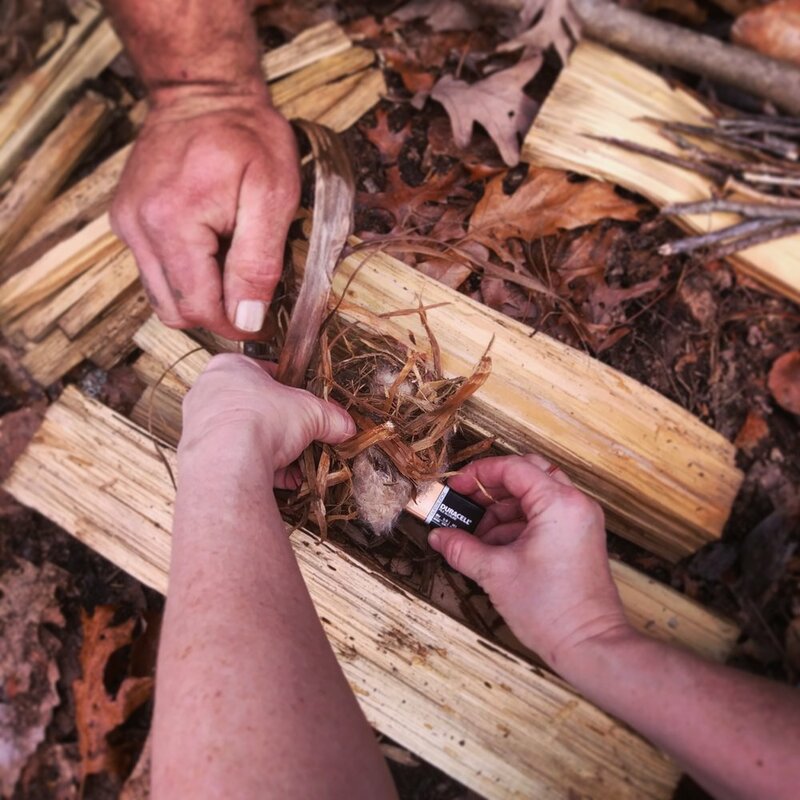 There will be certain times that one way will work better than another, and to consider yourself an accomplished woodsman, you need as many tools in your toolbox as you can gather. This one's an old Boy Scout trick that's worked for generations: Starting a fire with steel wool and a 9-volt battery. It works by using the highly conductive steel wool to short-circuit the battery, creating a lot of resistance and a LOT of heat - up to 1,800 degrees Fahrenheit. With this continuous heat source, you can even dry out damp or wet tinder that you might otherwise have trouble sparking to life. To ensure success, make sure your battery is good, and use as fine of a grade of steel wool as you can find - 00 and finer is best, as it has more surface area. Set up your fire lay and tinder bundle as you normally would, and touch the terminals of the battery to the steel wool. It'll start to glow, and you can blow that "coal" into your tinder bundle. While you can certainly carry a 9-volt battery and steel wool into the woods (there are a few pieces of gear left that still take 9-volts), I consider this to be more of a MacGyver skill. This method is a good one to consider for urban survival and post-disaster scenarios, as 9-volt batteries are found in smoke detectors, garage door openers, children's toys, and more, and can be scavenged and used in a pinch. Steel wool is in almost every kitchen in America, but you should be carrying some in your kit anyway - it has tons of other uses too! So no matter where you are, even if you don’t have your normal kit on you, you can definitely still get a fire going. Want to learn more cool firecraft tips like this one and lots more in a hands-on setting? Join us for Firecraft Essentials on Saturday, May 11th from 9am-7pm! Register now at https://www.sarcraft.com/course-registration/firecraft-essentials-1!